Stonewall Gazette: Watch: Colin Farrell Discuss Marriage Equality and His Critically Acclaimed Film, "The Lobster"
Watch: Colin Farrell Discuss Marriage Equality and His Critically Acclaimed Film, "The Lobster"
Hollywood heartthrob (and my second husband), Colin Farrell has been out and about promoting the dark comedy film, "The Lobster." The usually very fit actor gained weight for the role. In a recent video interview he shared what it was like to be on an awful diet to pack on those pounds! Colin is as charming as usual. He also discusses how he loved being able to film the movie back home (in Ireland) and talks about his support of gay marriage (which he has done before - see the other video at the end of this post). 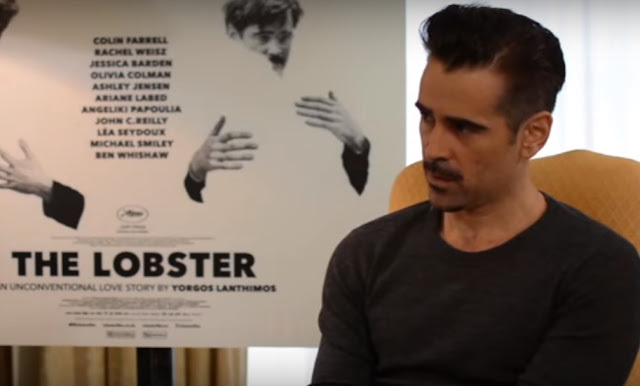 Watch Interview: Colin Farrell chats about his new film, "The Lobster"
Colin Farrell stars in the "The Lobster" with a wonderful cast of actors: Rachel Weisz, Jessica Barden, Olivia Colman, Ashley Jensen, John C. Reilly, Michael Smiley and Ben Whishaw. The reviews have been very good but the critics do warn the film goer that you'll either "hate it or love it." Entertainment Weekly's film critic, Chris Nashawaty described the film as, "visually stunning, narratively bold, and totally singular." Most critics do agree on one thing though - it's another great piece of acting from Colin Farrell. The handsome star was nominated for a BAFTA, Dublin Film Critics' Circle and IFTA for his lead performance in the movie. Watch Trailer: Colin Farrell in "The Lobster"
As I had mentioned, Colin Farrell has been a strong ally to the gay community over the years and was a huge marriage equality advocate in Ireland. He also campaigned against homophobic bullying for LGBT charity Belong To's STAND UP! because he witnessed seeing his gay brother (Eamon Farrell) bloodied after being beaten. Years later, Colin was also the best man at Eamon's wedding to Steven Mannion.